If you long for a fun-to-drive SUV, then the 2017 Hyundai Santa Fe Sport is the perfect vehicle for you to drive home to Edmonton, Cold Lake, Fort McMurray, or Calgary. With its sleek look, amazing performance, impeccable safety, and advanced technology, you’ll wonder why you ever considered driving anything else. Take one look at this vehicle, and you’ll instantly fall in love with what it has to offer. With multiple engine options, you can certainly get the power and performance you command. Whether you’re on the open highway or taking on the city, you can rest assured that the 2017 Hyundai Santa Fe Sport will keep you protected. From information to entertainment, experience all the technology this vehicle has to offer. 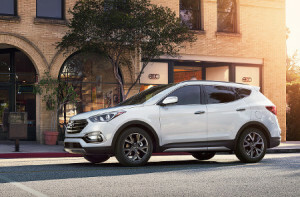 If you’re impressed with the 2017 Hyundai Santa Fe Sport, head down to River City Hyundai today and take a look for yourself. You’ll certainly be amazed at how much fun this vehicle is to drive, so contact us today at 877.916.9589 to schedule your test drive.